The rubber tree plant (Ficus elastica decora) is a favorite houseplant due to its attractive thick, large, glossy dark green leaves, besides it is considered an air purifying plant. It is known by different names as rubber fig, Indian rubber bush, rubber bush, rubber tree, etc. It is grown around the world as an ornamental plant outside or indoors. Caring and looking after your rubber plant is not difficult. Learn on how to care for a rubber plant indoors and outdoors which needs proper water, light, pruning and temperature; to keep it healthy for ever. Following are the key points on how to grow and care for a rubber tree plant. Caring a rubber plant is quite easy if you care for soil, light and water requirements. You can buy a small rubber plant from nursery or make one by propagation from cuttings (how to root a rubber plant from cuttings). Light and heat are the most important factors on how not to kill a rubber plant kept indoors or outdoor. 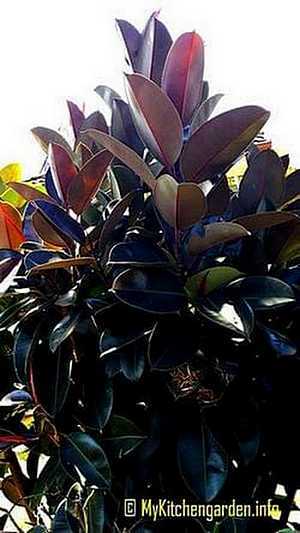 Position your rubber plant in bright indirect light, but never in hot sun, especially afternoon sun. Otherwise, the leaves will eventually fall off. When the new leaves are emerging, less light is preferred to promote larger leaves. Do not shift your rubber tree plant quite often from warm to cool environment as it is very susceptible to such changes. Keep your rubber plant away from heat sources. Use well-drained potting mix suitable for houseplants or made by mixing river sand to the potting mix in equal quantity. Correct watering is the most important thing in keeping the rubber plant healthy and growing. Keep your plant moist when the plant is growing in spring and summer, but on the dryer side during other time. The top soil should feel dry to the touch before watering. Add water to the pot until it drains from the bottom into the saucer. Empty the drained water from saucer. Keep moist in growing periods. But water only once or twice a month during the dormant period. Do not over-water. Too much watering will turn the leaves yellow and fall off and your plant will become leggy. Remove any dead leaves. Over-watering can cause drooping all the leaves in a short time. If this happens, it means the roots have started rotting. To revive the plant, prune the plant keeping at least one set of healthy leaves and don't water until the pot is dry. If the plant lacks water or moisture, the leaves will lose their firmness and begin to drop, but still on the branch. Increase the amount of water gradually until the leaves again firm and stand up. On very hot and dry days, mist your rubber plant with warm water in the morning. I wipe the leaves of my rubber houseplant with a damp cloth to remove dust and make the leaves shiny. How to make a rubber plant bushy? If you want to branch out your rubber tree plant, then you have to prune the plant (how to prune a rubber plant). This pruning will force the side shoots on the rubber plant making it bushy. If your plant has only one branch or shed most of its leaves and you want it to make it bushy, trim the top of the branch with a sharp pair of pruning clippers to encourage branches. Two or more new branches will emerge at the end. When these new branches grow 2-3 sets of leaves,then you may again prune the growing tips. This way your rubber plant will grow several stems and make it bushy. Don't throw the stem cutting of the branch, but rather grow a new plant from this cutting. You can also promote new leaf by cutting a fine slit using a sharp knife just above the node where the leaf fell off. The growing season for the rubber plant is spring and summer, give your plant a liquid feed when the plant is growing. Rubber tree plant is resistant to pest and diseases, if grown in well-lit areas, otherwise spider mites and mealybugs can attack the plant. The rubber plant oozes a milky white latex sap when its stem or leaf is cut. This latex was formerly used to make rubber, but it is not the tree for making rubber for commercial purpose. The latex is an irritant to the skin and eyes and toxic if taken internally. The rubber plant can grow very tall under the right conditions with very little care. My rubber plant touched the ceiling of the room and turned horizontally so ultimately I had to chop it. My rubber tree plant is growing very tall with only one branch. How can I make it with dense foliage? You can chop off the growing tip of the branch. This will producer more branches and the plant will become denser after some time. Zhengyi Wu, Zhe-Kun Zhou & Michael G. Gilbert, Ficus elastica, Flora of China, Missouri Botanical Garden, St. Louis, MO & Harvard University Herbaria, Cambridge, MA. Retrieved 29 August 2013.